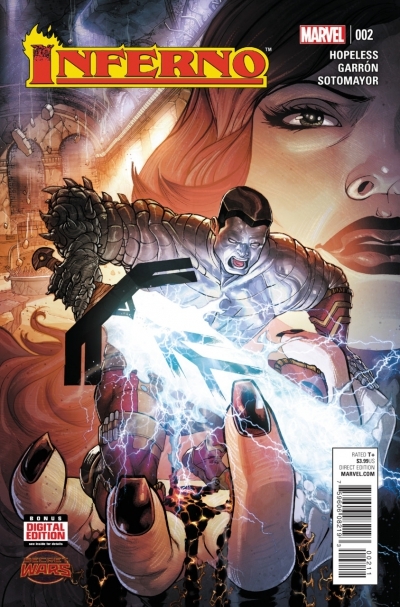 So last issue, it looked like Magik betrayed the team to Shadow King, who is currently using Karma’s body, as a host. Warlock isn’t happy about that. Warlock is out to hurt Magik! 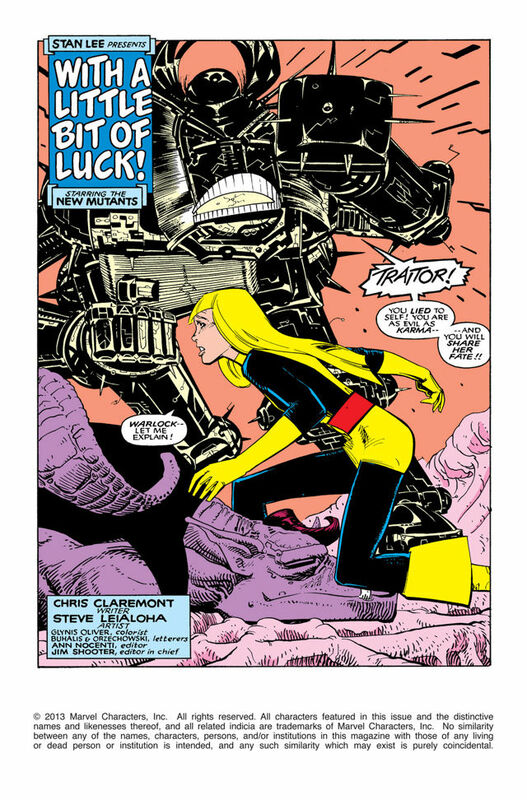 Which is silly, as Magik can defeat every member of the team, but I guess trying deserves a few points. Magik believes that Warlock has been given some bad advice from that always-scheming S’ym. Since this fight is happening in Limbo, the demons of the realm want to help their boss. I could always be down for a miniseries or ongoing, of just the politics of Limbo, as I can only imagine that Magik has a slew of contacts and friends there. Will, not anymore, since she absorbed the region, but during the classic years. Warlock wants to attack but Dani told him never to absorb living matter, unless she told him too. Since she is a hostage of Karma, all bets are off! He turns two of the demons into techno-organic matter, so that he can absorb them, properly. Magik knows that this is her fate, if Warlock has his way. But she governs this realm, and can do anything she desires. I like how she refers to it as “my magick is law” does she pronounce it with a very hard k? Magik changes from her New Mutants uniform to a powder blue dress, to calm him down. She looks so different, dressed like an innocent girl. She tells him that she has a plan and he is important to it. Warlock is still not trusting of her, so if he wants to kill her, she won’t stop him. This conflict blows up his head, as they are friends. My copy is in VF condition, which I normally don’t really notice it but this copy of the issue, has some thick inks over some words. Warlock starts melting, so disappointed in himself. She gives him a very encouraging pep talk and he is back together. I do like how he keeps calling her, OnceFriend. Like Doug is, TrueFriend, and I want to say he calls Wolfsbane, FirstFriend. Magik opens a scrying pool, to spy on Karma. So they must not know that she is being controlled by the Shadow King, yet. The rest of the New Mutants and Storm, are Karma’s prisoners and puppets. Karma has instructed Storm to humiliate her body and have her soul savaged. Since this goes against Storm’s true nature, she starts fighting the command. Karma brags that only Xavier can resister her commands. Illyana feels horrible, as she herself has been made into a slave of a foul and cruel master. I do like Karma insulting her clientele, loud enough for everyone to hear. They may think her disgusting but her club, Pharaoh, is the hottest place to be. 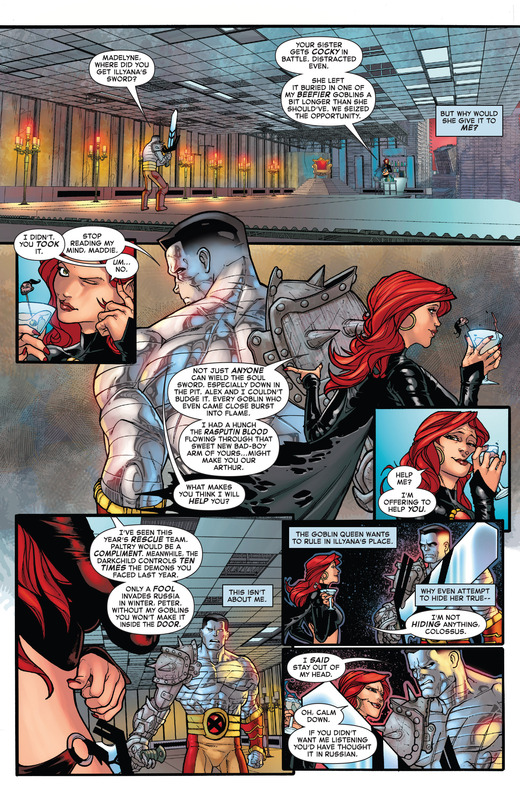 Karma starts toying with Storm, stating that Storm knows Karma’s true identity, that of Xavier’s oldest, bitterest and deadliest foe. I suppose that is up for debate, who is the biggest opponent of Xavier’s, Magneto or Shadow King? I think as exclusively Xavier villains, the Shadow King gets the point but I feel like Storm shares him with Xavier. Magneto is more of a team villain but so is Shadow King. Karma King’s big goal, for the night, is to do some psychic operations, to ensure that her puppets are her’s for all time. Cairo, twenty years ago. So Storm must be 26 or 28, I can buy that. We see (as does Magik and Warlock) Ororo stealing Xavier’s wallet. Xavier stops Ororo but then Xavier is stopped by an unknown force (Shadow King). I adore how happy Magik is, with herself, for getting a time jump correct. Magik witnesses the great mental battle of Xavier v Amahl Farouk, the Shadow King. I love that Leialoha doesn’t cut to the astral plane. We see Xavier sit down, Farouk fall face first onto a table and Xavier get up. That is how you do it! Magik uses some sweet deduction skills, and figure out that Farouk may have physically died but may have lived on, psychically. I do like how of the New Mutants, Magik and Warlock have the least experience with Karma, so they are having to figure out why this former team member has turn bad. Warlock brings up the excellent point, that they should probably call the X-Men, but FriendIllyana tells him that they don’t have any time, after tonight, the stakes will be at an all time low, as Karma would permanently have control of their friends and Storm. Is the kiss to Warlock, Magik’s first kiss? It is on the check but still,, it should count. Pharoh. Shade-ma (Shadow King / Karma) tells Ororo how Shadow King survived. Once his body was dead, he escaped onto the Astral Plane. It took a while for him to focus, and once he did, he found Karma in a weaken form. Shadow King’s scheme is to find another body, and leave Karma to be arrested for his crimes. Plus, super overweight. Shadow King plans on having Storm kill Xavier, which would be a bonus. During Shadow Karma’s big speech, Illyana interrupts, like a boss! One can’t merely lock a door, against a teleporter. Magik wants to be Shadow Karma’s partner. S/he wants to seal the deal with a kiss. 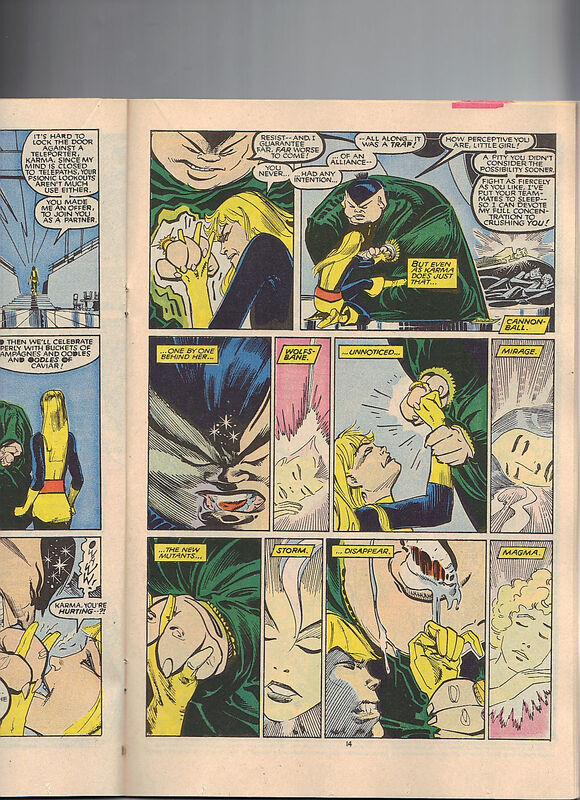 Shadow Karma starts crushing Illyana’s hands. As this is happening, Illyana is teleporting the team away. As her hands are about to be crushed, her entire body melts away. It was never Magik, it was Warlock! Which is pretty awesome of Claremont, as I wouldn’t have anticipated that. Thanks to their unique abilities, Shadow Karma wouldn’t have been able to read either of Magik and Warlock’s minds, so this twist is a real surprised. Since Magik brought the team to Limbo, she can undo any damage anyone did, as in Limbo – she rules supreme. The team returns, super enraged and ready for a battle! Dani makes FarouKarma (Warock’s name and it really does work!) see their worst nightmare, which is invading helicopters in Vietnam. So Karma is in confront. Poor Karma, wakes up, possibly in the worst situation. Cannonbal and Sunspot are quick to think that Farouk has jumped into another body. Wolfsbane is taken out, as she would be able to detect his presence. 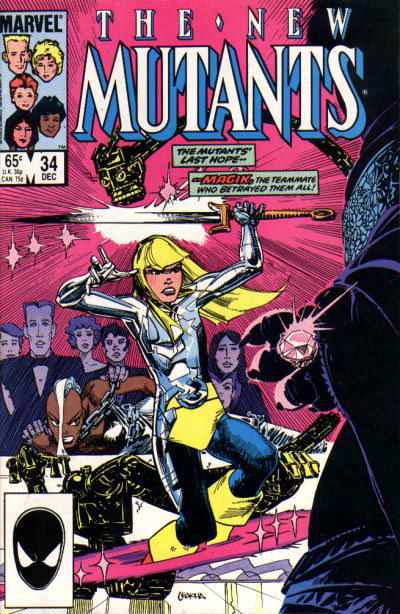 Illyana shouts that Farouk must be in Storm’s body and jumps at her, with soulsword primed to strike! Official Handbook of the Marvel Universe 1, completely revised and up-dated! 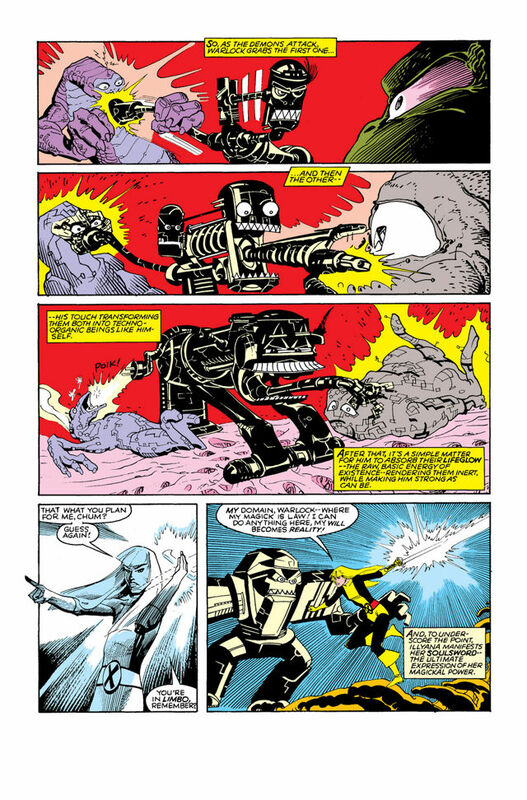 ROM Annual 4- Guest-starring Gladiator and the Imperial Guard, from the X-Men! Secret Wars II 6 – Featuring the greatest super hero of all — The Beyonder! With Cloak & Dagger, Power Pack, the Micronauts Thor, Power Man and Iron Fist! 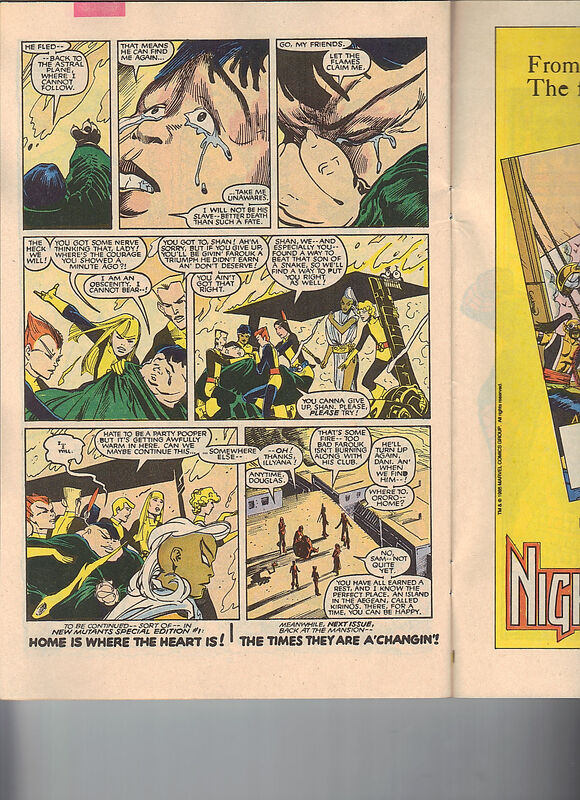 New Mutants Special 1 – Up against the combined might of Loki and the Enchantress by Claremont, Art Adams and Austin! Special cross-over with X-Men / Alpha Flight 1. 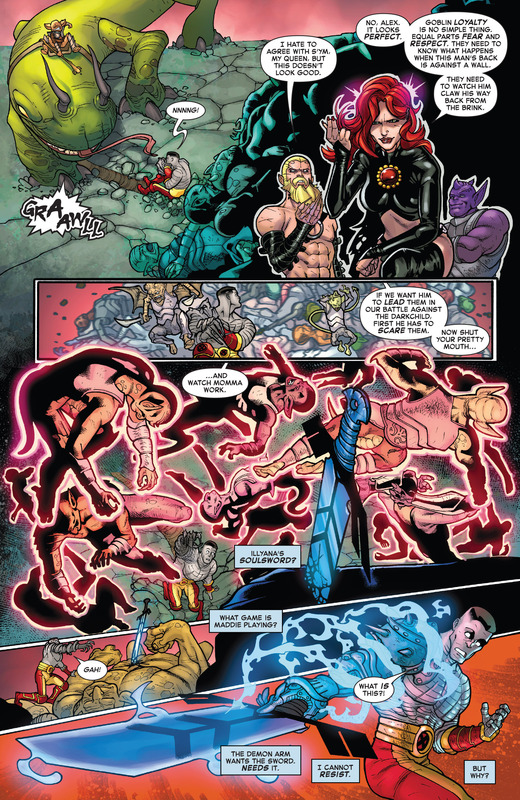 Marvel Agge 33 – A first look at X-Factor! 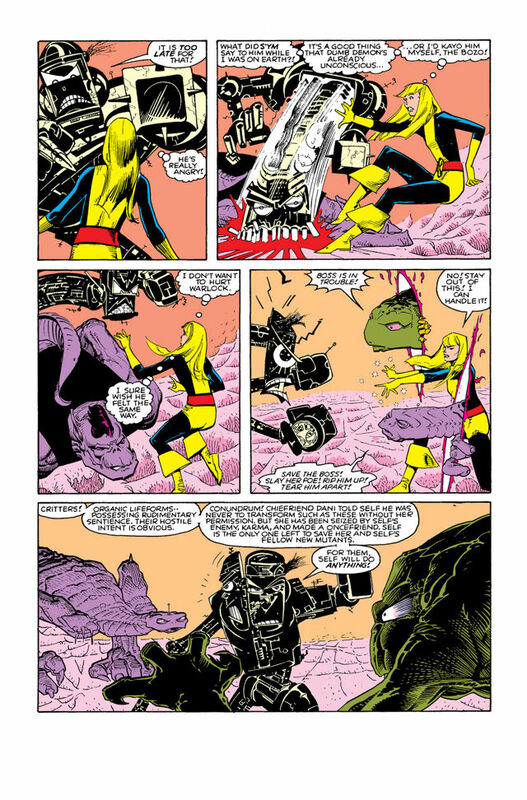 Magik does a classic fake out and stabs Doug! oh Dani, she says (very loudly) that Doug is their weakest member! That’s pretty harsh! Pretty good plan, on Farouk’s part. That could have been a decent What If, right there! Storm fights DougFarouk but Karma gets to give the finishing blow. Cool visuals, Doug v Karma, until we cut to the Astral Plane. We get to see Karma’s original skinny body. Shadow King escapes. Karma freaks out, as she rather die than have him take over her body again. Karma starts straight weeping, as she is super overweight and ashame of everything that has gone on. The team promises to stick with her, and will get her back to normal. Which segues us to New Mutants Special Edition, where Karma will lose all of the weight due to Loki putting her in the middle of a desert, and letting her walk it off. That Loki, he is a good guy. There is a house ad for Nightcrawler’s original miniseries, that is awesome, written and drawn by legend – Dave Cockrum. The minsieries also guest stars Lockheed! 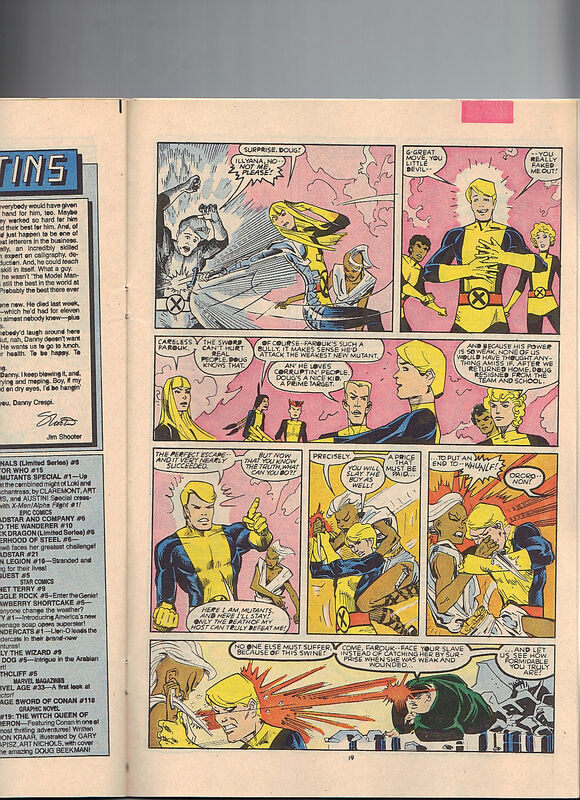 Inside back cover is for Secret Wars II 6 with its tie in issues – Thor 363, Micronauts 16, Power Man and Iron Fist 121, Power Pack 16 and Cloak and Dagger 5. So again, long time readers know this – but today is my birthday. I am now 34 years old today – hence the issue 34 reviews. I’m a clever one. Please come back tomorrow for the beginning of . . . Lockpool Month! Or, Deadheed Month! We are going to do both Lockheed Month and Deadpool! Sort of like last August, when I tried to do both Big Brother and a proper Fantastic Four Event Month. I’m hoping it all works out though. So I just typed all of this for my X-Men Classic 49 review but thought it would work as a separate post. When I was a child, I didn’t respect the whole ‘fortune teller’ gimmick and the lady probably picked up on that at the state festival. She read a few cards, showed them to me and told me that I was going to die on August 23, 2023. She didn’t give me the date but told me this sequence of numbers that if I did it right (the memory of the math hasn’t stuck with me like the original plot and the date has). So that has messed me up and I want to say I was ten or eleven at the time. My second experience with gypsies came on the last day of the Shakespearean Festival that a club I was part of went to in Phoenix. Money was running low and we were just trying to get back to the bus. This was circa May 2000, or right before it as I was definitely a senior at that point. This lady tried to get my attention and to buy a chocolate covered frozen banana. I like bananas but never been a huge chocolate fan. Plus it was frozen, I didn’t want to deal with all that and so I turn it down. She aggressively tried to bargain with me (not sure why it was so important to her) and I again turn her down. Then she placed a curse on me that whenever I see a chocolate cover frozen banana, I will instantly start desiring one and my mouth will start watering. Which just typing all of that, has made my mouth water. It is so silly but I’ve been cursed! The only time I’ve seen one or had it offered to me is at the Prospect Avenue Dairy Queen. It was a sign on their drive through window. I read the sign and my mouth starts to water. Good thing they didn’t ask me if I wanted one! So those two stories and Doctor Doom, are my only experience with gypsies. What I need is a positive experience with a gypsy. I could not figure out a way to get it to just show up here. Ooof, I am getting older as nine years is so much less than the 30 years I remember thinking was forever from now. By August 23, 2023 – I would be 41 which now seems too young. Now. Battleworld. Deadpool is still under the impression that the heroes are dead. Just then the Lizard jumps at him, as Lizard is under the impression that Deadpool may be the one who broke Wasp’s heart. So did Deadpool get Magneto’s role from the original Secret Wars story? Deadpool admits to Wasp using and seducing him, so that doesn’t help matters. Deadpool ends up ripping off Lizard’s tail, which seems rather harsh. A Few Days Earlier. Deadpool is with the X-Men as they prepare to leave the hero’s base for Magneto’s. We get some funny comments from Deadpool here. Storm states that they will bear no oppression and Deadpool chimes in that they will also not oppress any bears. Wolverine sees where this is heading and tells Deadpool that he isn’t a mutant, thus he shouldn’t be there. 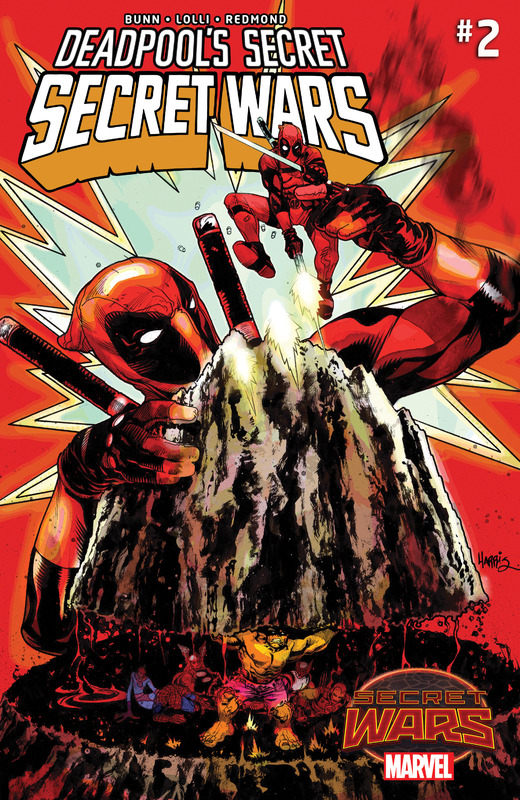 Deadpool defends himself – Wolverine stabs things, so does he. Storm has control over lightning but he can sense the electricity. Strangely, he states that he can’t teleport like Nightcrawler, which throughout his first ongoing, he was teleporting all over the place – so maybe that came with the Joe Kelly’s legendary run? Xavier senses Spider-Man and we get that quick fight where Spider-Man defends himself against the entire X-Men, which still seems out of place. or really, whenever he can bring up Spider-Man, he mentions how Spider-Man trounced the X-Men to great humorous effect. Spider-Man runs off and Deadpool gives chase. Spider-Man wants to find the other heroes and snitch on the defectors. 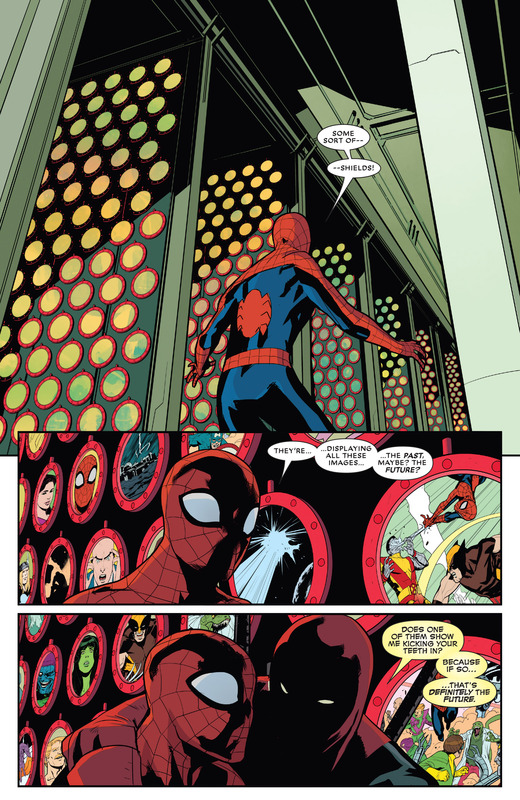 Spider-Man enters a room full with shields, with images of events the series, both of the past and yet to come scenarios. We get a pretty nice Deadpool v Spider-Man fight sequence. The fight ends with Spider-Man swinging Deadpool into the shields and he webslings away. 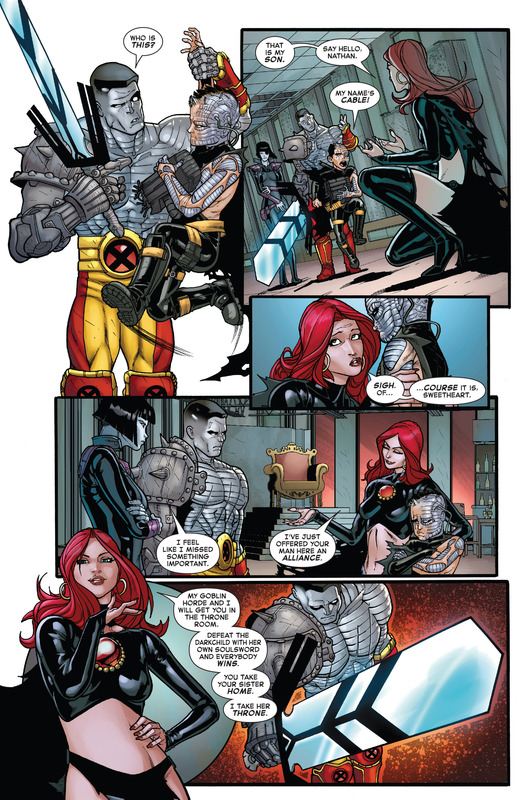 Deadpool grabs a shield and meets back up with Xavier and Wolverine. Xavier has mind wiped Spider-Man, so the X-Men’s plan is okay. Xavier senses some sort of psychic energy off of Deadpool’s sword. We get the image of Ryan Reynolds, as Deadpool, spoofing Burt Reynolds’ pose on the carpet in front of a fireplace. Now. Deadpool is trying to talk sense into Lizard. Deadpool tells Lizard that he is trying to save the Wasp, which calms Lizard down. That Time With The Mountain. The classic moment from Secret Wars 4, with the mountain being dropped on the heroes, including Deadpool. Hulk is holing it up as Reed tries to make a machine to free them. Deadpool takes on the role of angering the Hulk, which frees up Reed. There is a fun gag about Deadpool trying to make Captain America jealous as Deadpool’s shield showed him pictures and all Cap’s shield does is be thrown. Reed takes the machinery out of Deadpool’s shield, which Deadpool is sure that Cap must be happy about that. Now. Lizard tells Deadpool that Wasp fixed up Lizard’s arm, which is why he is so protective of her. Earlier. Zsaji, the healer, is healing She-Hulk. She-Hulk sees that Deadpool is hurting but he is only hurting emotionally as he misses his shield. She tells him to go get healed, which Zsaji is just finishing up with Human Torch. She heals Deadpool, and with the cancer gone, he is handsome and mustachio. He picks her up and proclaims his love for her. 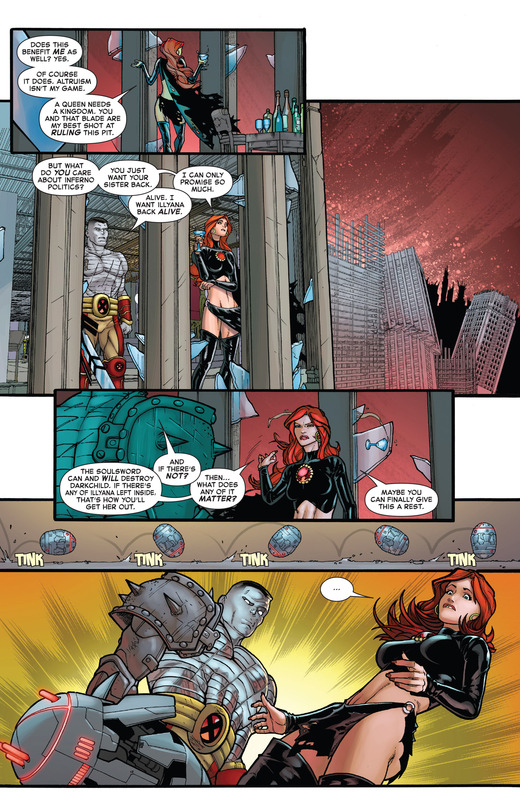 We can see that Human Torch never got to bag her, so that probably means Colossus will not be falling for her either. The issue ends with the shield flickering to life and showing Deadpool holding Zsaji in that classic Pieta pose. “THE WAR MACHINES” PART 3! • Spider-Man, War Machine and Iron Man team up to stop a brand new threat to the Marvel Universe… like only they can. All this plus more hints to next summer’s insane Marvel blockbuster event. Makes sense that Spider-Man will show up in this title, with Mary Jane being around now. This title makes sense too, and I’ll be skipping it for the time being. 2015’s overnight internet sensation takes center stage in her own ongoing series! Gwen Poole used to be a comic book reader just like you…until she woke up in a world where the characters she read about seemed to be real! But they can’t be, right? This must all be fake, or a dream or something, right? And you know what that means…NO CONSEQUENCES! Could Gwenpool truly be Marvel’s least responsible and least role-modely character to date? She can if she tries! Well, this is another non-surprised but I’ll be skipping this fad until I have a reason to pay attention to it. THE BOOK YOU’D BE INSANE TO MISS! Marc Spector (a.k.a. Moon Knight/Jake Lockley/Steven Grant) has been fighting criminals and keeping New York City safe for years… or has he? When he wakes up in an insane asylum with no powers and a lifetime’s worth of medical records, his whole identity (indentities) are called into question. Something is wrong, but is that something Marc Spector himself? Jeff Lemire (EXTRAORDINARY X-MEN) and rising star Greg Smallwood are calling everything you know about Moon Knight into question. Another kooky Moon Knight title that I’ll be passing on. The Spider-Event of 2016 is here, bringing SPIDER-GWEN, SILK and SPIDER-WOMAN together for a story too big for any one of their books! Spider-Woman is taking a mentor-role with Silk and Spider-Gwen, and the three spider-heroes take a brunch break on Gwen’s Earth-65. But when the nefarious spy organization S.I.L.K. and their leader (Earth-65’s Cindy Moon) notice the interdimensional interlopers, all of Jessica Drew’s plans go wrong. I like this, conceptually, but I won’t be buying any of these. • …and accidentally stopped their own origins from happening! • …A nice man named BEN. • Up from the depths! Thirty stories high! He salutes the flag and eats apple pie! • Corporal Todd Ziller is the AMERICAN KAIJU – America’s ultimate weapon against renegade super-science! • And he’s going to get the Whisperer back in custody – if he has to break Avengers Island in two! I was enjoying reading this but then the actual plotpoint cropped up and now I’m back to not being interested. • What could possibly hold its own against the American Kaiju? None other than – AVENGER FIVE! • Five New Avengers in the ultimate ultra-vehicle – fighting to save A.I.M.! But are they giving up their freedom – or their lives? • Plus: The traitor revealed! Sunspot’s secret schemes! And the guest-star reveal you’ve been waiting for! Could this be Kitty Pryde finally joining the Avengers? I doubt it. • This is it! The explosive finale to the spring’s blockbuster Avengers event! • Lost heroes return, new threats emerge, and the stage is set for major upheavals all throughout the Marvel Universe! Many of these tie-ins don’t sound good at all. IT’S HYPERION VERSUS THE CARNIVAL! I wonder how crucial the stray dog is. • Does defeating Antimatter mean the end of Singularity? As Singularity faces Antimatter on her own, prepared to sacrifice her own existence, A-Force rallies behind her. With Tempest Bell’s help, SHE-HULK, CAPTAIN MARVEL, MEDUSA, and NICO MINORU make a final bid to save Singularity from destruction while still saving the world from Antimatter’s ever-growing threat. But every action has a cost, and what will these actions cost A-Force? The stakes do seem rather high with this! “Small Time Criminal” STARTS NOW! That’s a pretty funny final line there. • Get to know Cho! That’s teen genius Amadeus Cho, the seventh smartest person in the world — but who’s counting? • When Cho is declared “Mastermind Excello” by an intelligence contest, his life suddenly spins out of control — and now he’ll need all his smarts just to stay alive! • Luckily, Cho — and his adorable coyote pup, Kirby — quickly meet and befriend two of the Marvel Universe’s strongest powerhouses: Hercules and the Incredible Hulk! • When Cho investigates his sister’s fate, a complex web begins to unravel. Who has been manipulating him? And why? • Can the seventh smartest person on the planet solve the riddle of his own past and future? • Collecting material from AMAZING FANTASY (2004) #15; INCREDIBLE HULK (2000) #100; and INCREDIBLE HERCULES #126, #133, #135 and #137. Pretty smart to release this, not sure why it didn’t come out when issue one of Totally Awesome Hulk did, that would have been the time to do it. The engagement of the galaxy is over! But Peter Quill and Kitty Pryde still have to share a ship, and work, and friends, and…yeesh. This is going to get awkward, isn’t it? Well, fortunately they’re surrounded by caring, communicative teammates like…Drax…and Groot…and Rocket…Hoo boy. This is going to be VERY awkward. Finally, finally we are going to get this story! So they are no longer together – that’s a huge shame! Super awkward, indeed! • Hermetikus’s evil ambitions are tremendous—you could say they’re GALACTIC in scale! • Does this villain hold a strange connection to the Guardians 1000? 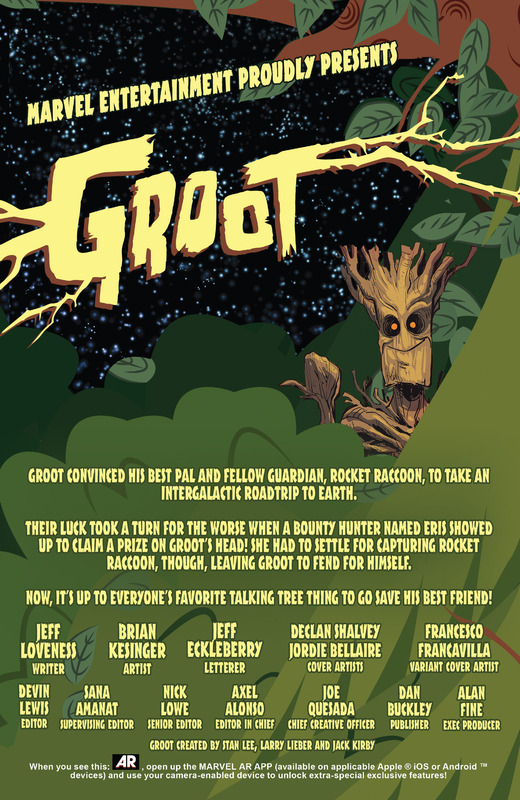 • Even though Rocket, Drax and Groot have joined a GUARDIANS SUPERGROUP, they might be in over their heads! • Plus! Writer JEFF KING (White Collar) and artist FLAVIANO ARMENTERO show you what happens when Rocket and Kitty act as bodyguards for an interplanetary whistleblower! Someone finally heard me! Kitty (and Rocket) is spotlighted in the backup! Wish this wasn’t a five dollar comic but these things happen. Hopefully not a new trend. • BEN GRIMM: SPACE BARBARIAN! • The Thing might miss some things about Earth, but he does admit that space has its perks. Riding alien horses into epic battles is one of them! From the description, I don’t think that is Kitty on the cover. Looks like we’re getting a Thing solo adventure. THE CONCLUSION OF “ANIMAL HOUSE,” A CROSSOVER WITH THE UNBEATABLE SQUIRREL GIRL! • WATCH! Howard show Squirrel Girl how to be a REAL hero for a change, for which she is eternally grateful! • LEARN! 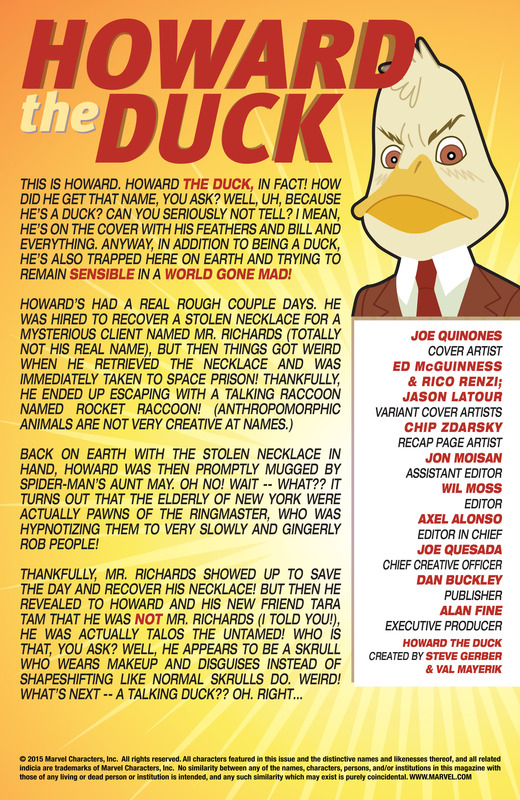 what happened in last month’s UNBEATABLE SQUIRREL GIRL #6 from the recap page! • LISTEN! to a nice audio file of nature sounds made by Chip & Ryan while you read this VERY good story! • LOVE! all the guest stars! Like one of the blue guys from X-MEN! And a pretty cool van! This solicts are always fun! I hope it is a guest appearance by Nightcrawler and not Beast. • Massive fallout from the events of Silver Surfer’s 50th Anniversary issue. • There is a price to pay for what Norrin Radd has done. • Some actions can never be taken back…or forgiven. • Will any of Earth’s heroes stand by the Silver Surfer’s side in this, his greatest moment of need? • A mythic tale in the Mighty Marvel Manner! Guest starring The Avengers, The Thing and major characters from around the Marvel Universe. Looks like Kitty didn’t get involved in last issue’s hijinks from those who appear on the cover. Also from that cover, Silver Surfer may need a few more pillows. That board can’t be comfortable to lay on, or stand on for long periods of time. • As all of his magic dissipates, Doctor Strange is at the mercy of THE IMPERATOR! • The powerless sorcerer is no longer supreme and can’t possibly best a super-powered foe hell-bent on his destruction. He should probably call former student, Magik, for help! This also seems like something that should have come out at the beginning of the arc. It wasn’t like Marvel was afraid of too many number ones. Hopefully the X-Men get a month or the new Guardians of the Galazy! • Can Patsy and friends make it out of this one? Answer: NO! They all die and the series is over. Another fun write-up, it must be the same person, right? After the cataclysmic events of last issue — Battlerealm will never be the same! But Earth’s ultimate superteam has discovered the Contest — and they don’t like it at all! Is this the end of Maestro’s dream of power? Or the start of a whole new Contest of Champions? Fan-fave writer Al Ewing combines two of his new series into one can’t-miss epic! What is the other title? He isn’t writing Hulk and I can’t think of what it could be. Odd ot not promote it here. I wonder how this is going to work with only 22 pages of story. I’ll have to check it out as I’m a big fan of CYOA books. • POWER MAN and IRON FIST are swimming through New York City’s currents of crime trying to retrieve the SUPERSOUL STONE. Beware the underworld undertow! • Meanwhile, JENNIE and BLACK MARIAH’s nefarious plans begin to bear fruit. • With a magic-fueled crisis at its tipping point and all of New York hanging in the balance it’s the perfect atmosphere to rekindle a smoldering friendship, so GET IT TOGETHER ALREADY, LUKE AND DANNY! I do like telling people “to get it together” or “come on!” “Be better” is another Klein househould favorite. • Trapped in the distant future, Colossus and his team of Young X-Men race across a dying Earth to protect the key to mutantkind’s survival! • But Apocalypse and his new horsemen are in hot pursuit, eager to take it from them. • Will the Extraordinary X-Men arrive in time to save the future of their species AND their friends? Hopefully Magik appears in this crossover, at some point. Time travel, I’m not crazy about as Apoclypase should be big enough of a story to tackle. I wonder who Apocalypse’s new horsemen are. Could be the movie peeps – Magneto, Storm, Caliban and Psylocke. • That’s right, it’s OLD MAN LOGAN vs. OLD MAN ROGERS! Future Old Wolverine and Current Old Captain America is a fun story idea. • The battle has been fought, and won—but at what cost? As Laura and Gabby attempt to move on with their lives, Wolverine’s past seems destined to catch up with her, and wreak havoc. • Logan’s legacy has cast a long shadow, how can Laura hope to step out of it? 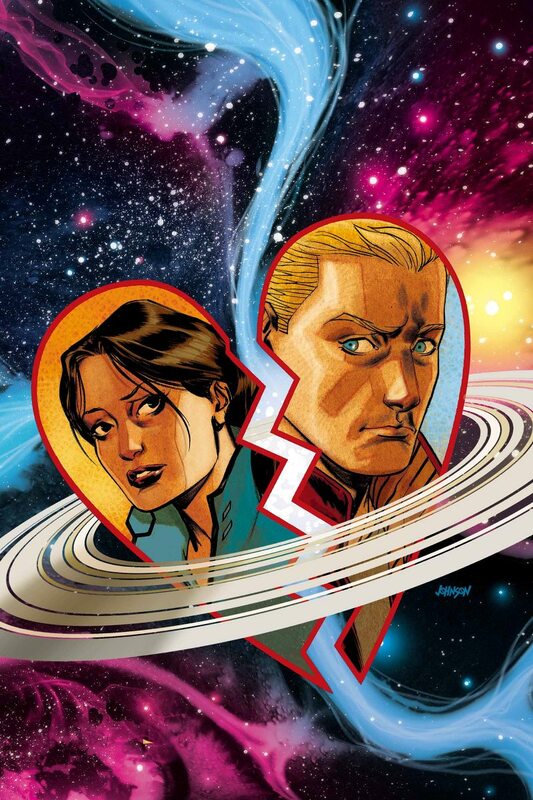 People seem to be upset over at the X-Books Forum of CBR, that the cover is a major spoiler. I suppose they thought all of X23’s clones were going to end up dead. Instead, the youngest one (and fan favorite) is going to be All New Wolverine’s new teen girl sidekick – which is a fun twist on an old formula. • Bailey struggles to fit in among his hated and fear compatriates. • PLUS: Meet possibly the most powerful X-Man ever…Miranda? • Max Bemis’s Mutant Masterpiece continues here! For some odd reason, Hastings’ copies of the first two issues have been delayed like crazy. I know I need the first issue for sure. • The wait is over! • High atop the Himalayas, Dicky Dauntless searches to find his place in the Age of Miracles. He’ll make new friends and encounter a frightening, familiar face — Johnny Bates! • It’s Young Miracleman and Kid Miracleman face-to-face! I still wonder how Marvel is suppose to earn all of their money back from this purchase. $5 is a start, per issue, but that is going to take forever to equal the first million. I wonder how I’m suppose to order this through Hastings. Nine characters for $25 seems a bit much but if one of those is Magik, I’m all over this! Only Doctor Strange can protect our world from the darkness beyond — now, witness the full toll that constant struggle takes on Earth’s Sorcerer Supreme! Every spell cast comes at a cost, but what happens when Strange falls behind on his tab? Find out as the good doctor wakes up somewhere very odd, nearly naked — with no spell books, no weapons and no memory of how he got there…or why all the monsters are chasing him! And as a new visitor to Strange’s Sanctum Sanctorum learns one wrong door can lead to oblivion, a magic circle of Strange’s friends and allies are about to face their greatest threat. Dark forces are destroying everything mystical in the multiverse, and their sights are set on this dimension. Magic’s days are numbered, and Doctor Strange is not ready! 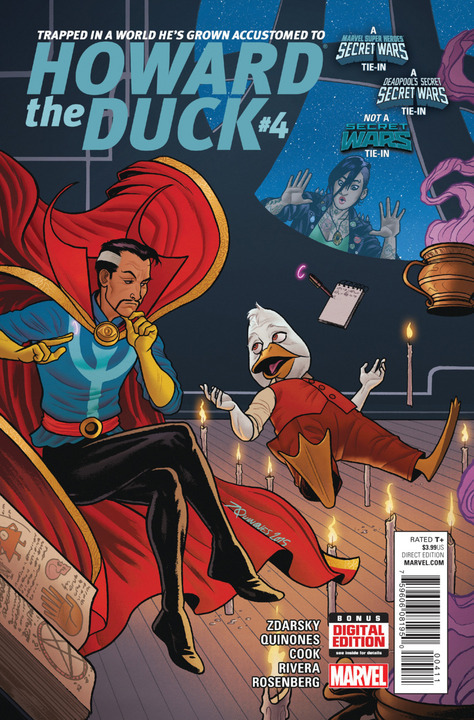 Collecting DOCTOR STRANGE (2015) #1-5. Magik is in the fourth issue of this trade, maybe not worth the $25 alone but it has been a good story, thus far. Todd McFarlane became a superstar illustrating AMAZING SPIDER-MAN, but he changed the industry forever with his next project: the “adjectiveless” SPIDER-MAN! Taking on both writing and art duties, McFarlane ushered Peter Parker into a gritty new era — and it began with “Torment”! When the Big Apple’s streets run red with blood, the web-slinger heads into the sewers to stop the Lizard’s homicidal rampage. But what is driving his old friend and foe? Plus: Ghost Rider lends a bony hand when the deranged Hobgoblin returns, the wall-crawler finds himself at the center of a clash of claws between Wolverine and Wendigo, and Pete goes back in black to face Morbius the Living Vampire! And in the ultimate nineties team-up, Spidey joins X-Force to battle the unstoppable Juggernaut! Collecting SPIDER-MAN (1990) #1-14 and #16, and X-FORCE (1991) #4. Does this mean that McFarlane and Marvel are on speaking terms? Or is the money from this suppose to help bridge the gap. I wonder why his Amazing Spider-Man issues didn’t make this trade, as they came first. That Torment arc is so good and more people should read the Wolverine storyline, that isn’t referenced enough. I guess double shipping means an entire wave of these trades are coming out at the same time. The first issue was pretty decent. With the fate of mutantkind in the balance, it’s an All-New, All-Different beginning for the X-Men! Staring down a threat to her race like nothing seen before, Storm pulls together the group she’ll need to ensure mutants’ survival — including Iceman, Jean Grey, Colossus and Magik! But can Storm and Iceman protect the last remaining mutants from a demonic attack? As a new child of the atom discovers her terrifying power, an old foe compounds the horror: Mister Sinister will bring the team face-to-face with their greatest fear. But can anyone be ready for the very first meeting of Old Man Logan and young Jean Grey? Bring all the hate and fear you want, they will fight to their last breath to survive the experience. They’re the X-Men, they’re facing down extinction, and they will be Extraordinary! Collecting EXTRAORDINARY X-MEN #1-5. This has been such a good series, even with the Mister Sinister appearance. This is the flagship title, so I highly recommend jumping on board with this trade. In the waning days of the Vietnam War…the Punisher is born. The year is 1971. With mounting casualties and a rising anti-war sentiment, America’s time in Vietnam is coming to a close. Yet in the isolated Valley Forge Firebase on the Cambodian border, Captain Frank Castle is one of the few soldiers still committed to the fight against the enemy. With dwindling reserves, Castle must stand against an impending Viet Cong attack that threatens to wipe out the entire American platoon. To survive the battle, what grim decision must he make that will forever alter the course of his life? In this acclaimed tale, superstar Garth Ennis reveals the never-before-told story of the horrors Castle was forced to face to come home from Vietnam alive — ending in a shocking twist that will forever change how readers see Marvel Comics’ most famous urban vigilante. Collecting BORN #1-4. I predicted the ending of this series, after the second issue and was super disappointed that Ennis actually took the character in that direction. There is a reason why there is no lame sequel to this series. The Masters of Evil take Avengers Mansion! In one of the greatest comic-book epics of all time, Baron Zemo strikes at the very heart of the Avengers as he leads a revamped and larger-than-ever Masters of Evil in an attack on the team’s home — and wins! And as if that wasn’t enough, Earth’s Mightiest Heroes must survive the climax of SECRET WARS II, and a battle for the ages between Kang and Immortus! 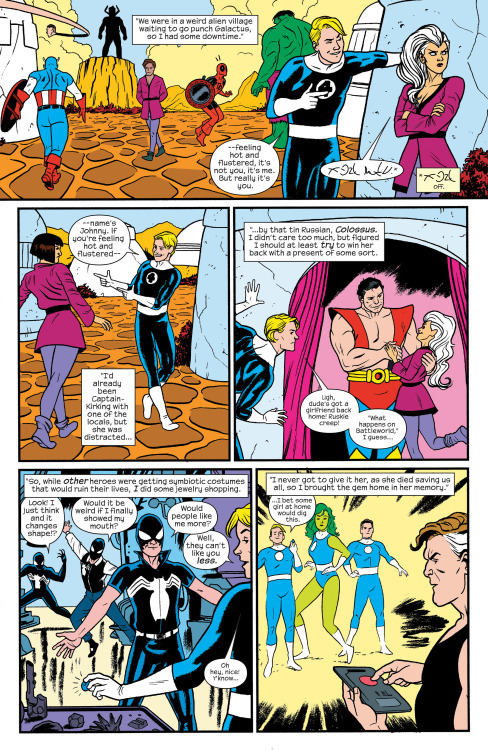 The Sub-Mariner’s membership leads to public protests, but that won’t stop the Avengers and Alpha Flight from lending a hand during Attuma’s assault on Atlantis. Meanwhile an old friend turns enemy: What’s gotten into Quicksilver? Two teams of Avengers will assemble to find out! Collecting AVENGERS (1963) #264-277, ALPHA FLIGHT (1983) #39, AVENGERS ANNUAL #15 and WEST COAST AVENGERS ANNUAL #1. Under Siege is such a must-read Avengers storyline! A fresh take on a classic saga! Magneto’s future, Wolverine’s past — and the X-Men in between! Magneto acquires a new army, the Hand revives an old enemy, and it’s up to the newly reunited and rejuvenated X-Men to stop both! But from Asteroid M to Weapon X, Marvel’s mightiest mutants are getting brainwashed wherever they go! Featuring mysteries from Wolverine’s history and the first flashback appearance of Team X — plus Acolytes, ninjas and more! Omega Red! Maverick! Sabretooth! 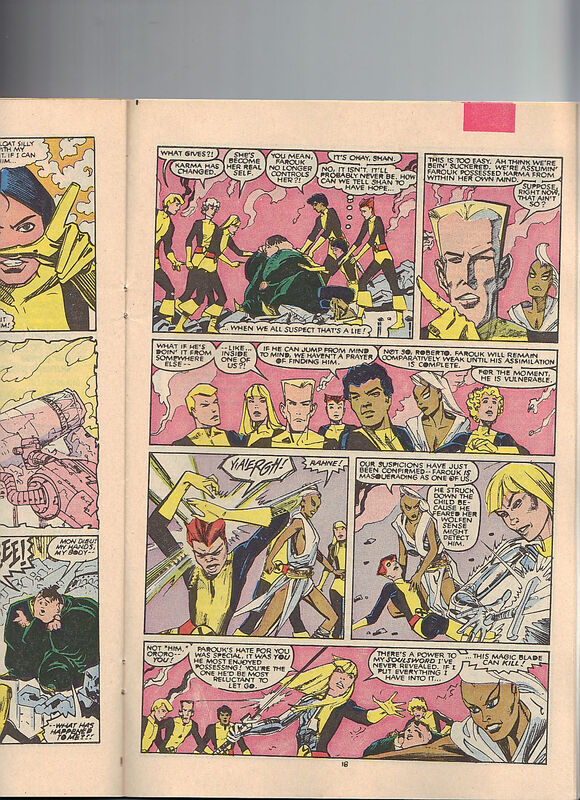 And the debut of the classic Blue and Gold X-Men teams! It’s the opening issues of 1991’s blockbuster “adjectiveless” X-MEN series like you’ve never seen them before — remastered and fully recolored in modern style! Collecting X-MEN (1991) #1-7. The end of Claremont’s first tenure and Jim Lee plots. I don’t quite recall issues four through seven. The first three are high octane though! As one of the greatest X-Men of all makes her triumphant return, and one of mutantkind’s deadliest threats debuts! When Jean Grey is found alive — with a little help from the Avengers and Fantastic Four — she reunites with the rest of Xavier’s original class to form X-Factor! But as Cyclops, Marvel Girl, Beast, Angel and Iceman face new enemies Tower and Frenzy, little do they know the villains are part of an Alliance of Evil led by…Apocalypse! They’ll encounter uncanny new foes like Bulk and Glow Worm, and old sparring partners in Freedom Force, but there’s no question who will rise to the role of their arch-nemesis. The story of En Sabah Nur begins here! Collecting AVENGERS (1963) #263, FANTASTIC FOUR (1961) #286, X-FACTOR (1986) #1-9 and ANNUAL #1, and material from CLASSIC X-MEN #8 and #43. Makes sense to get as many Apocalypse trades out into the world, a month before the movie comes out. I’ve had this special ordered for such a long time now. Glad it is finally coming out! So April 2016 still isn’t that expensive, so that’s nice! Taking out the two books, that leaves me with six total comics. $26, for all six. 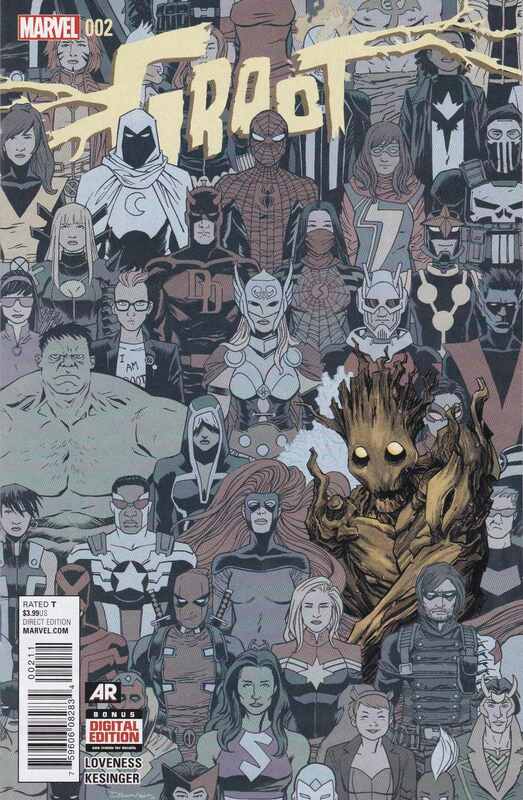 I’m sure Magik is in Extraordinary X-Men and Kitty is in the proper Guardians title, as well. Six comics is a dollar off per title, so I’m looking at $20 for the entire month. That’s how I like it! I have to add Little Marvels Standee Punch Out Book to my order and double check to make sure Guardians of the Infinity is on my list. I’m sure I’ve put issues of it back, already, like I’ve done for Star Lord but now these titles are getting good.